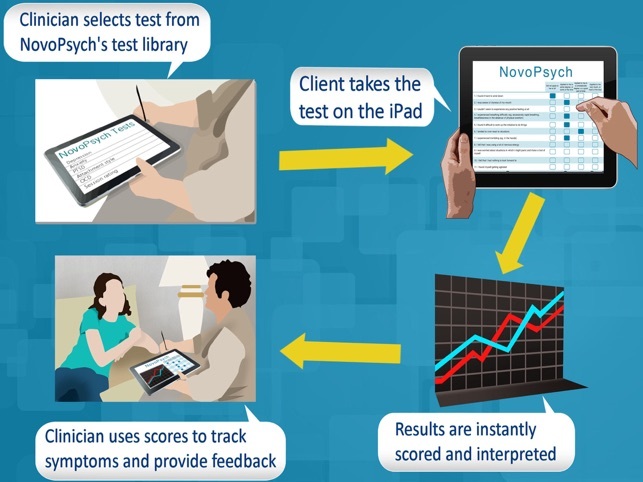 NovoPsych delivers psychological assessments via an iPad where clients can complete tests in your office or waiting room by simply tapping the iPad's screen. The results are automatically calculated and sent to you, their clinician, giving access to scores, sub-scales and percentiles instantly. Say goodbye to hand scoring tests! • Vancouver Obsessional Compulsive Inventory (VOCI). If you regularly administer psychometric tests using paper and pen then NovoPsych will save you a significant amount of time. 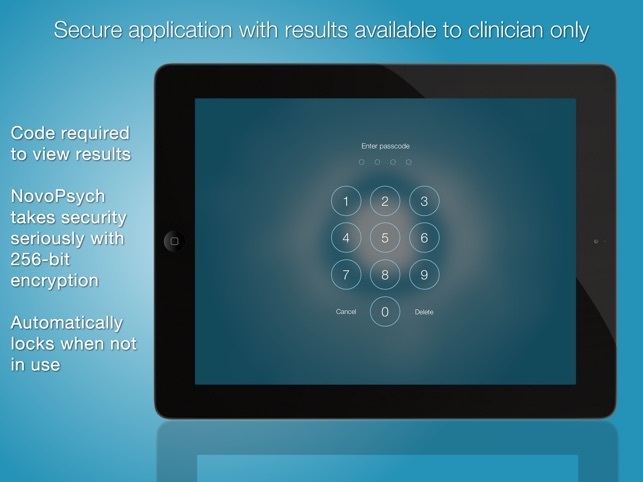 This application improves the time efficiency of your practice by removing the need to print, store and score psychometric tests. It allows you to administer widely used psychometric tests, and scores are converted into percentile ranks so clinicians are provided with data to appropriately interpret test results. 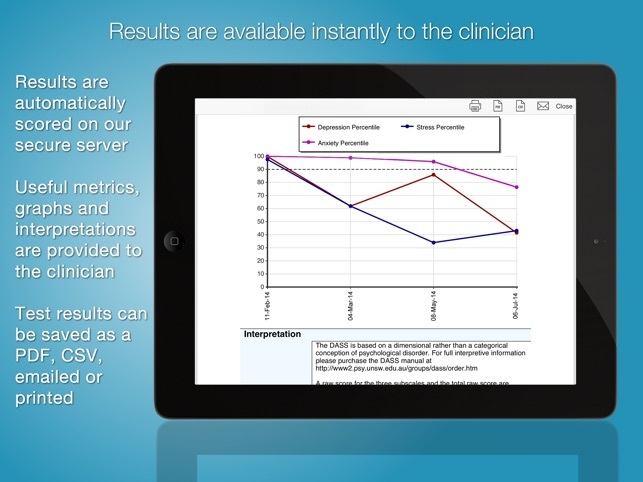 It graphs results over time so you and your client can see symptom change. NovoPsych complies with the highest data security codes of conducts in professional psychology, and data is transmitted with AES encryption, so you and your clients' privacy is protected. 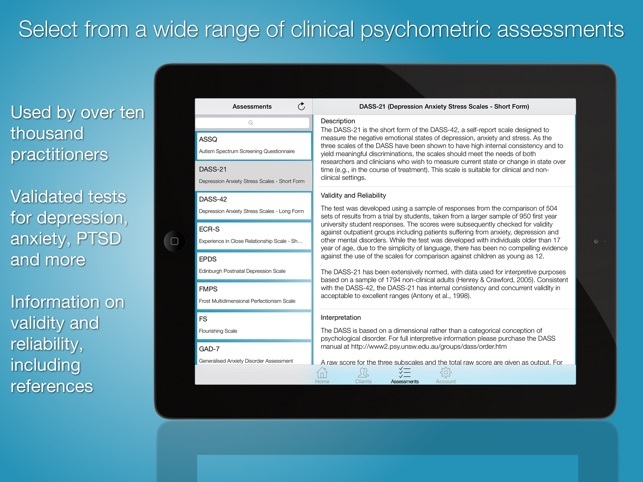 The tests currently included in NovoPsych are free and in the public domain. You can administer them as many times as you want without additional charge. You will be given the option to upgrade to our subscription service, which will provide you with more features and support. 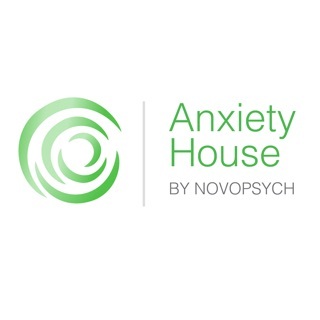 For a small but busy private practice, Novopsych is becoming our go to battery for evidence based assessment and screening tools and a must have for any psychologist, psychiatrist, GP or any clinician working with mental health. Scoring and reporting is fantastic and a great tool to show patients/clients how they are travelling over time. Regularly updated with new tools and measures. Highly recommended. I have downloaded the app as it advertised having SRS and ORS in it's list of available tests. I use them frequently, but I wasn't interested much in the other tools. However, after purchasing, are not in the list at all. The developer's email contact doesn't work through their website, and I'm very disappointed.